Thank you for purchasing the Kanakadea Atlatl Kit. We hope you will find it a pleasure to finish and use. Your kit contains a wooden shaft, a spur made of tropical hardwood, a wooden “Y”, sandpaper, and a strip of leather . You will need a small amount of wood glue that is impractical to pack with the kit, and scissors. We recommend Elmer’s Carpenters Glue, Franklin Tightbond or epoxy. 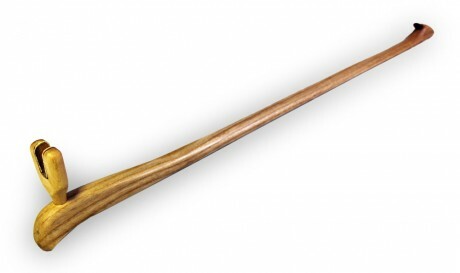 You will also need Linseed oil, Tung oil, stain and/or paint to finish your atlatl. After sanding, rub the entire surface of the wood (excluding the tine hole) with Linseed or Tung oil. You may also stain or paint your atlatl to finish it but either Linseed or Tung oil work for finishing the atlatl. Find the small strip of leather in your kit, glue it into the wooded “Y” with the softest part of the leather on the outside. Trim the leather to fit the “Y”. After the leather is firmly adhered to the “Y” and trimmed. Glue the “Y” into drilled hole on the hand grip portion of your atlatl shaft. Let is set. You now have a finished Kanakadea Atlatl. What is your price for the Kanakadea kit with darts. This is my first purchase of a Atalat. Sorry, we have to get better at checking these. The atlatl kit with three dart kits is $54 plus $20 shipping. Thank you. Sorry for missing this. The atlatl kit with three dart kits is $54 plus $20 shipping.